From tossing a cooler in the bed before a tailgate to hitching up your boat to get out on the water, pickup trucks and summer go together like peas and carrots. 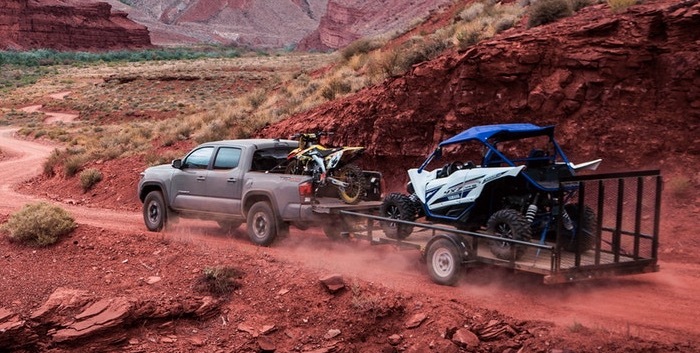 Warm weather is perfect for bringing out all of your favorite toys, and your Toyota pickup is perfect for getting them exactly where they need to be! When it comes to trailering, though, overworking your truck or choosing the wrong truck is a quick route to trouble. Fortunately, our team is here to help you plan accordingly to ensure all of your summer adventures go smoothly. How Much Can Your Toyota Tow? If your lifestyle calls for a lot of hauling or towing, then chances are that the keys to a pickup are hanging off of your belt loop. Whether you drive a Toyota Tacoma or a Toyota Tundra, our Morristown dealership can attest that you’re packing some serious power under the hood. When hitching up, it’s important to consider not just your truck’s towing capacity, but also that of your hitch. The 2018 Tacoma is capable of towing up to 6,800 lbs when properly equipped, for example, but a Class II hitch maxes out at 3,500 lbs. To go beyond that, you’d need to switch hitches. With these figures in mind, you can plan appropriately to capitalize on your truck’s true capabilities. Considering that the 2018 Tacoma can tow up to 6,800 lbs and the 2018 Tundra can tow up to 10,200 lbs, it’s easy to see how crucial choosing the right hitch can be! If you have questions about what your truck can handle or how to better prepare for hauling, don’t hesitate to talk with the experts at Toyota of Morristown. You can contact us by calling (973) 540-1111 to get more information.